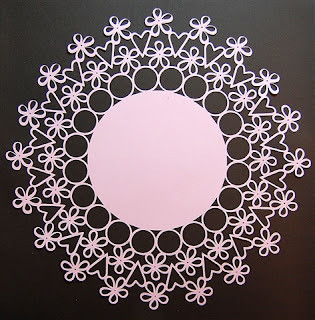 Capadia Designs: Very Complex Doily - All George and Tricky! So this is a rather long story. I decided to try a complex design to see if there was an "upper limit" to the capabilities of the CDS software. I used George on the silhouette setting for the hearts and flowers. The process of designing was slow but simple - copied and pasted the shapes over and over changing the angles to get the welds. The hardest part was getting the size of the small circles around the solid center circle to come out evenly. After I got the design done and previewed the welding it all looked good - here is a screen shot of the top of the design (one of the frustrating things in CDS is that you can't see everything at once when you do a large design unless you make it fit to screen but then it is too small to see details). The silhouetted hearts flowers and even circles were cutting off center and as they got further from the center of the mat were more and more off center and resulted in cut off hearts and flowers - not what I wanted. I wondered if I had a bad cartridge so I appealed to the Cricut message board members for help. Sandy (LehighGal on the Cricut message board) tried cutting the design on her machine and it worked for her so I knew the issue was somewhere with my machine and/or cartridge, not the .cut file. I got lots of suggestions regarding the mats, blade position, etc. At this point I was out of town and not able to experiment with more cuts since I didn't have my machine. When I got home I gave it another try - thinking that maybe something was wrong with my George cartridge. 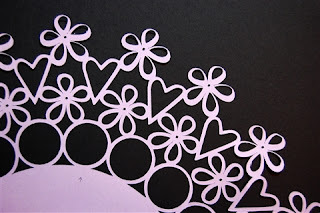 The overall effect is better but the top right corner still suffered some overcutting resulting in broken flowers and many of the hearts had a very thin side and a thicker side. So I tried this advice and also took out a brand new mat that was perfectly flat (I had noticed that the edge of the mat I was using did have a bit of a curl to it). I did a test run on the line of flowers and they cut evenly all the way down the line (the red ones were the first test - the light ones are after adjusting blade and on new mat). It's not perfect but I decided I could live with this since nothing cut through. 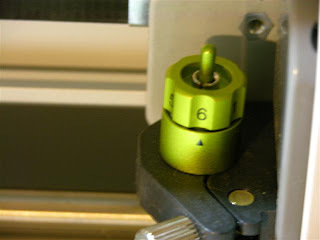 I may try again with a bit more tweaking of the blade housing position. 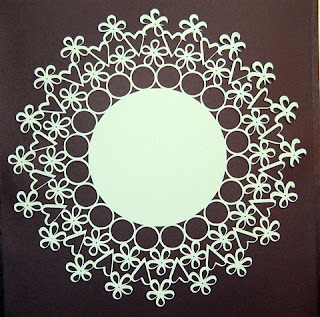 I will share this file with the warning that you may have to go through several tries and do some adjustments to get it to work but, with luck and some fiddling, you may be able to cut your own doily! There is one place in the upper right where I missed a weld between a flower and the inner circles but I left it that way as a deliberate imperfection (as in quilting). You can easily change this if you want to. 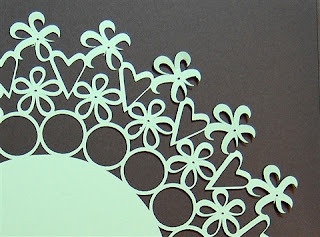 There is a second mat on the .cut file and this is to cut a circle inside the design creating a frame. To do this do not unload the mat when the first design is done cutting - just change to the second mat on the screen and cut the second circle (at least that will go fast!). Thanks again to all the message board members who helped me finally get this to work! Good luck - let me know how yours turn out if you try this. Girl, you have the patience of Job. Read all about this on the MB, admire your persistence to get it the way you wanted it. Wonderful! 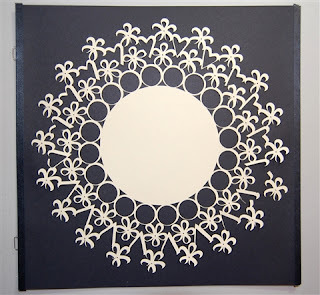 I cut it out and it looks like a big beautiful snowflake! Thanks so much for the cut file - I had to adjust the blade housing and use a new mat to get it just right but after two attempts it's perfect! Thanks so much!